Nørreport, the busiest station in Denmark. Around 250.000 people a day are getting off and on by s-train, metro, bus or also bike. 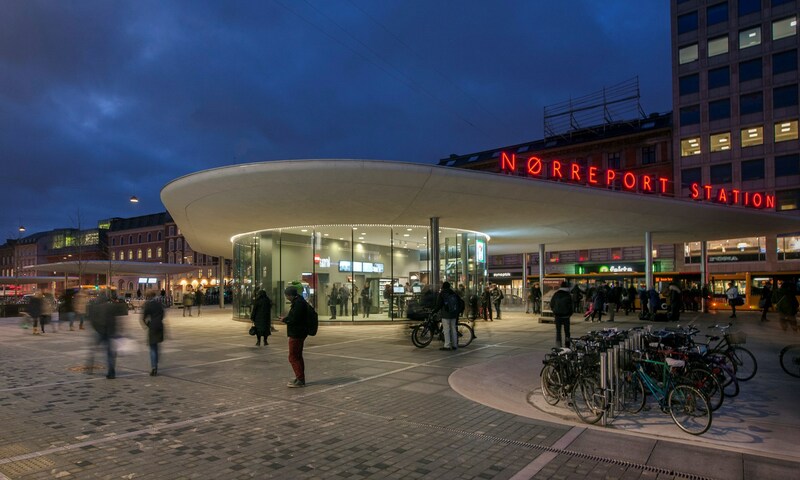 The old Nørreport has had its time and therefore a new Version has been composed out of series of rounded, floating (green) roofs and glass pavilions. The study of pedestrians and their prefered routes has shaped the basis for the new design of the station. From this perspective a new open and welcoming public space has been established concerning the needs of pedestrians and cyclists. The bike parking will one of “the” features which are giving space to 2.500 bikes. Those parking lots are 40 cm below the ” walking level”, which can be understood as “bicycle beds”. A clear hierarchy has been created an area for bikes and an area for the thrilling and busy city life around Nørreport. Finally the concept was not only about beauty and cyclists. The green roofs which are more visible for the neighboring area from the 2nd floor, are getting in action (the vegetation is able to absorb a great deal of the rainwater) after a heavy rainfall and a number of solar cell zones on the roofs are contributing to the station’s energy consumption. Additional on the the edge of the square, numbers of trees are providing also a green atmosphere on the street level. Banedanmark: client with regard to concrete renovation and with regard to the Public Transport Authority’s renovation of the long-distance platform. DSB: in charge of new, up-to-date station buildings. City of Copenhagen: in charge of the station concourse. Grontmij: consultants to activities above ground as well as underground.